2017 was the 500th Anniversary of the start of the Reformation in Europe. 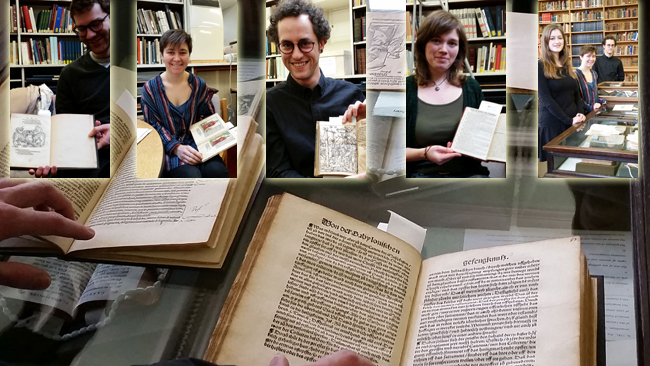 To mark the occasion, a number of initiatives were undertaken in Oxford, including the digitisation of Reformation Pamphlets by students of the History of the Book method option for the MSt in Medieval and Modern Languages. The texts, originally published on a blog, were launched by the Cultural Attaché of the German Embassy, Ms Charlotte Schwarzer. Book Launch: "Sermon von Ablass und Gnade"
Book Launch: "Sendbrief von Dolmetschen"
The Taylor Institution Library acquired the greater part of its significant collection of Reformation texts and pamphlets in the 19th century at the suggestion of Professor Friedrich Max Müller (1823-1900), who, although better known as an Orientalist and Professor of Comparative Philology, was also the Taylorian’s second professor of Modern European Languages. The librarian, Dr Heinrich Krebs (1844-1921), a native of Darmstadt in Germany, was able to acquire many as duplicates from German libraries, notably from Heidelberg in 1878. Further additions were made in the 1920s and 1930s and two titles were presented by Professor Hermann Georg Fiedler (1862-1945) in 1940. The library now has 436 pamphlets ranging in date between 1518 and 1589, mainly by Luther with a few by Melanchthon, Hans Sachs, Hutten and others. Eyn Sermon von dem elichen stant. [Leipzig] : [Wolfgang Stöckel], . Eyn Sermon von dem Elichen standt vorendert und corrigirt durch D. Martinus Luther Augustiner zu Wittenburgk. [Wittenberg] : [Johann Rhau-Grunenberg], . Hortulus animae. Lustgarten der Seelen: Mit schoenen lieblichen Figuren. Wittenberg: the heirs of Georg Rhau, 1558. Passional Christi vnnd Antichristi. [Erfurt] : [Matthaeus Maler], 1521. Disputatio excellentium D. Doctorum Iohannis Eccij & Andreae Carolstadij quae cepta est Lipsiae XXVII Junij. An. M.XIX. : disputatio secunda, D. Doctoru Iohanis Eccij & Andree Carolostadij quae cepit XV Julij ; disputatio eiusdem, D. Iohannis Eccij & D. Martini Lutheri Augustani quae cepit. IIII. Iulij [s.l. ]: [s.n., 1519?]. Eyn wunderliche Weyssagung / von dem Babstumb / wie es yhm biß an das endt der welt gehen sol / in figuren oder gemaͤl begriffen / gefunden zu Nuͤrmberg / ym Cartheuser Closter / vnd ist seher alt. Nuremberg: Hans Guldenmund, M. D. xxvii. Jar. 1527.